In the previous episode, the vines had taken over the entire garden, two walls of the barn and gone over three fences. Pumpkin vines, squash vines and sweet potato vines were hopelessly tangled together. Aside from the fact that this made getting around in the garden to check on the plants impossible for me, it also confused the bees who were doing their jobs collecting nectar and distributing pollen. It’s a great trade when it works. The problem here is that all squash blossoms look alike to a bee. They will merrily buzz from zucchini, to mayo arrote to pumpkin. This isn’t a problem when they buzz from zucchini to pumpkin or from the mayo arrote to the zucchini. It is apparently a problem when they buzz from pumpkin to mayo arrote. 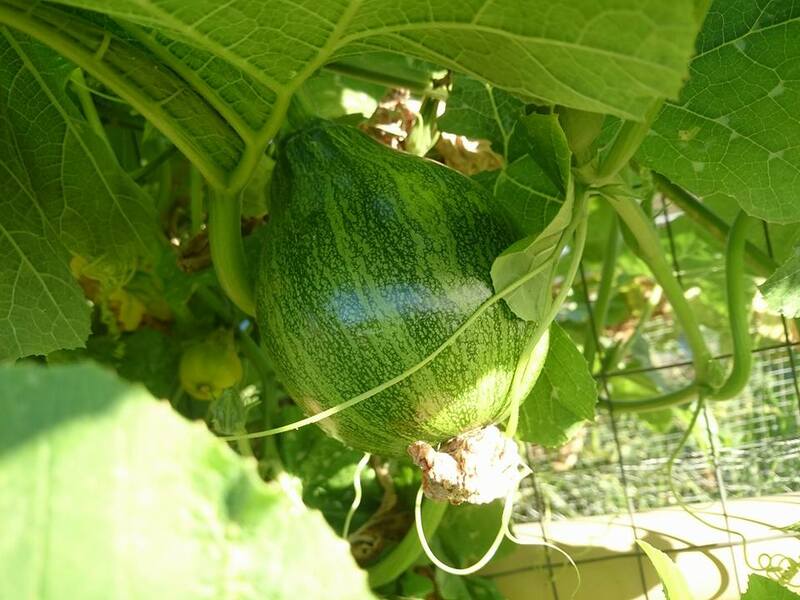 While checking the garden one morning, I discovered several new mayo arrote squash developing on the vines climbing the stall walls. 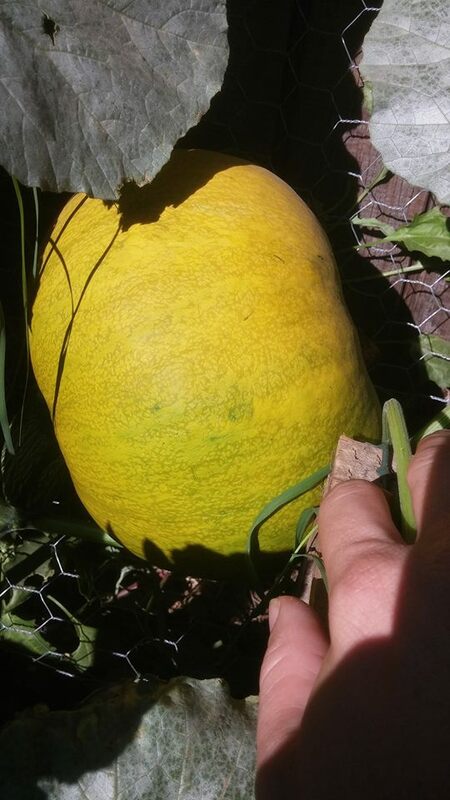 Following the vine, checking for more, I found a bright orange and green squash about the size of a baseball, hiding in the leaves. 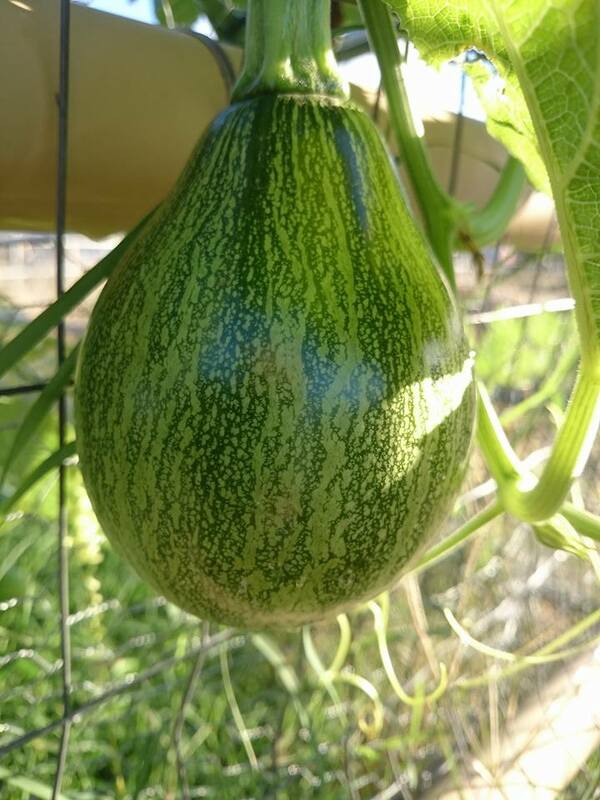 Mayo arrote squash are a very pale color with light green mottled stripes. As they mature, some of them will develop a few bright yellow streaks. None, however, are orange. 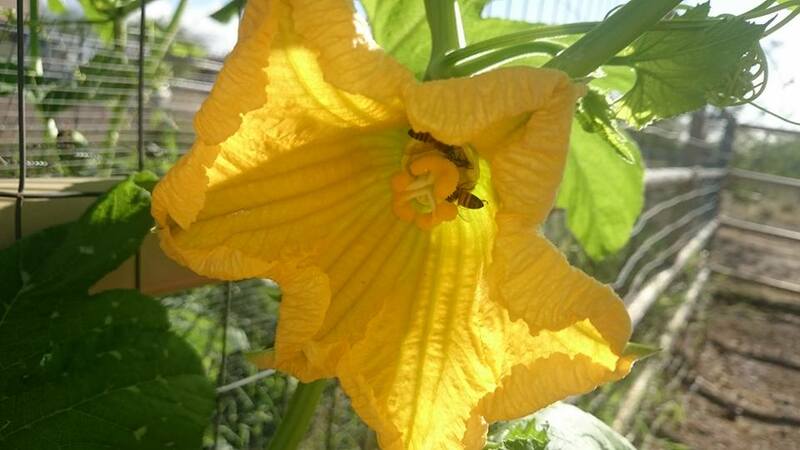 There are a few types of squash which can cross pollinate. Mayo arrote and pumpkins are, apparently, two of those types of squash. We have a Squmpkin. A BIG squmpkin. It’s entertaining, but not something that needs to be repeated. When we plant next spring, we will be sure to keep the two well separated. Because we had gone quite garden/free food crazy, we decided to start another bed in the backyard adjacent to the patio. For years there had been a large lush creosote bush in that spot. For unknown reasons, that bush suddenly died and had to be taken out. The bush had provided a good bit of shade on our west facing patio. I wanted to replace it with something that would provide shade, but couldn’t find anything suitable so the spot remained bare. 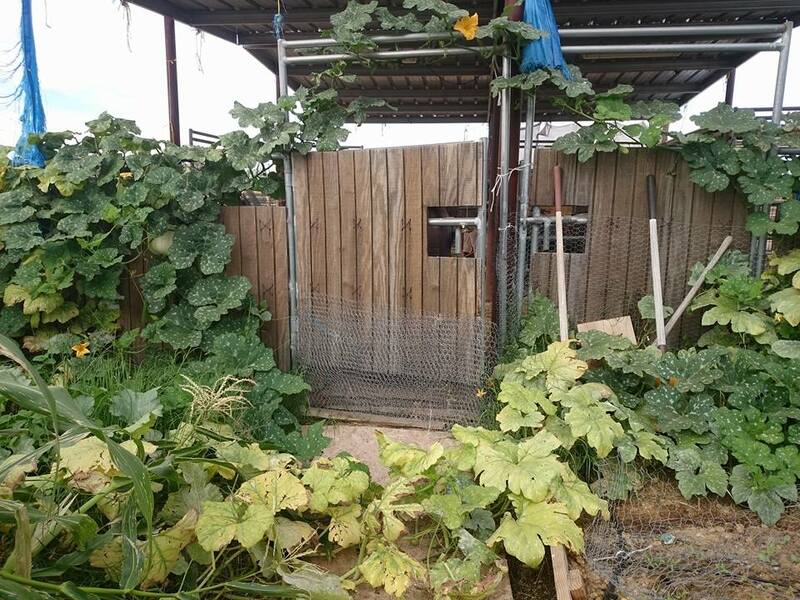 As we watched the vines in the larger garden doing their best to turn the barn into a tall, green mound, we realized that a small garden in that spot could not only provide food, but if we gave vines something to climb, we’d have shade as well. We used old pallets we’d gotten for free at a local business and slid them down over T posts for vines to climb. We added the poop trifecta in the enclosed area where we have planted large leaf and sweet basil, oregano, parsley and sage (the rosemary bush is by the front porch. Sorry, no thyme). 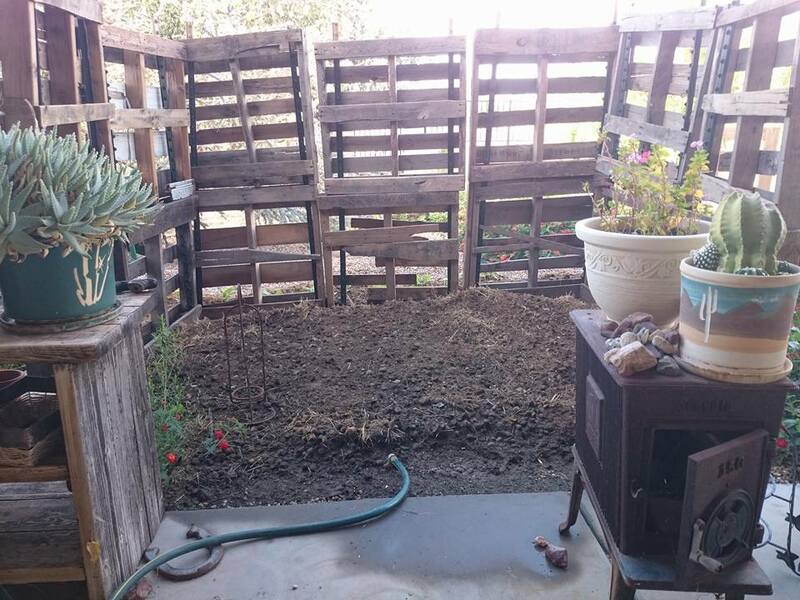 We also added our manure mix along the outside of the pallets where we will be planting grapes next year. We’re hoping the vines will do well because those pallets are less than attractive as is. If we have no luck with grapes, we’ll just plant more squash because heaven knows those vine like crazy and will turn those ugly pallets green in no time. When we put in the larger garden, we had only planted one half. It doesn’t look like we only planted one half, but we did. By end of summer, we’d collected enough poop to fill the second half about 18 inches deep. Once we added the manure to the second half, the squash, pumpkin and sweet potato vines saw all that pristine earth and we’ve had the devil’s own time beating them back. We’d thought those vines would have died off by now, but it’s November and we’re still waiting. 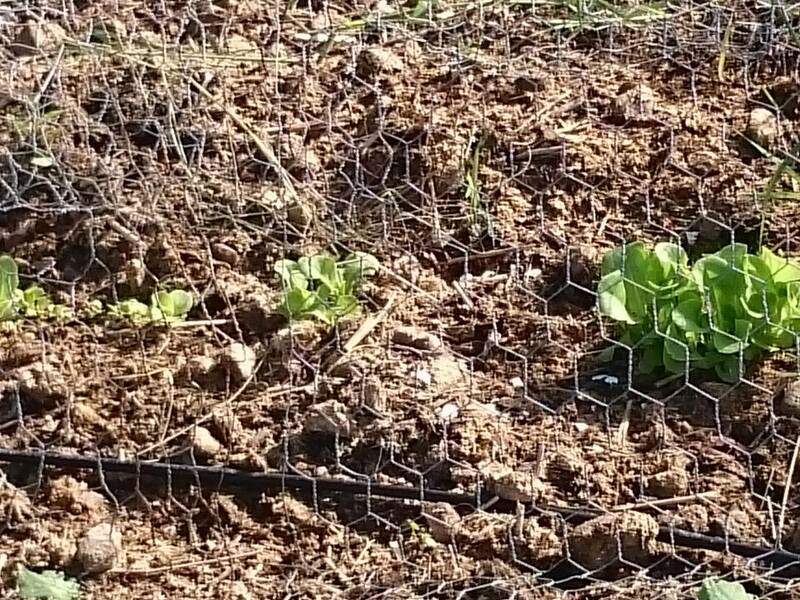 In the second half of the garden we planted artichokes, brussels sprouts, cabbage, corn (probably a mistake but what the heck) a wide variety of lettuces, and both red and white onions. 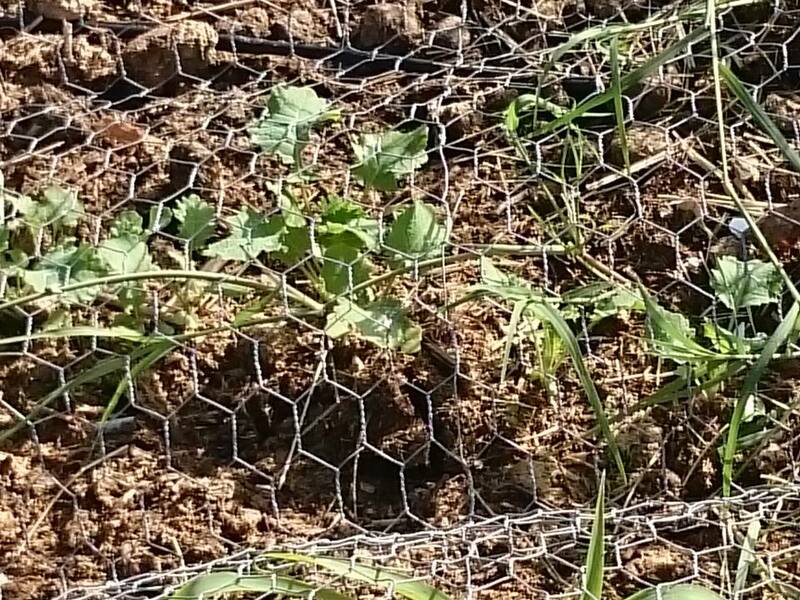 I had posted on our local small town Facebook group that I needed old chicken wire and leftover bits of hardware cloth to protect the seeds and sprouts from those birds with divining powers. We ended up with an abundance of free wire that just needed a bit of straightening to make protective tents. I noticed this morning, however, that I’m going to have to hit the plants with a bit of Neem oil as some of them are mildly bug chewed. Everything has sprouted well and looks happy, except the onions. We’ve had a very few onions sprout. However, when we were out and about last week we picked up a tray of red, white and brown onions to plant just in case. If the others sprout, terrific, there’s no such thing as too many onions in my kitchen. Meanwhile, the squash vines are still producing and still spreading. They’ve reached the hay room fence and have also spread over the top of the south facing stall wall. There are 5 new squash on the south facing fencing alone and 4 more growing within the main garden. The squmpkin is almost completely orange now and quite a bit bigger than a basketball. Time to hunt down more squash recipes. Definitely going to serve squash dishes for the post Thanksgiving Juggling Feastival. Great Gardening Experiment part 2. At the end of part 1, the vines had covered the garden. Pumpkins were mingling with sweet potatoes, squash were mingling with everything. Smaller bushy plants were being overrun, and even the mint I had planted was struggling to breathe under the heavy load of squash vines. Any time I wanted a nice jug of mint tea, I’d have to crutch my way through vines and then lift those vines up enough that I could reach the mint. The bees were having a tough time carrying pollen from boy flowers on top of the squash canopy, to the girl flowers underneath the leaves. The other problem we were having at the same time was the invasion of the bermuda grass. Two varieties of manure in our fabulous poo trifecta, were from ponies and goats that were eating bermuda grass hay. The hay here in Aridzona is lousy. It is full of weeds, often has dark brown spots, and has so much human trash that when I get a “roadside” stack of 88 bales, it looks like it actually was baled off the side of a highway. The hay is also quite often cut too late and has gone to seed. Those seeds pass through the start of the pony and goat digestive systems and emerge fully functional from the other end. If you’d like a lush lawn, go offer to remove the poop from Phoenix barns where the horses are fed bermuda. Just spread that around your yard and water it for a few days. You’ll be the envy of your lawn growing neighbors. 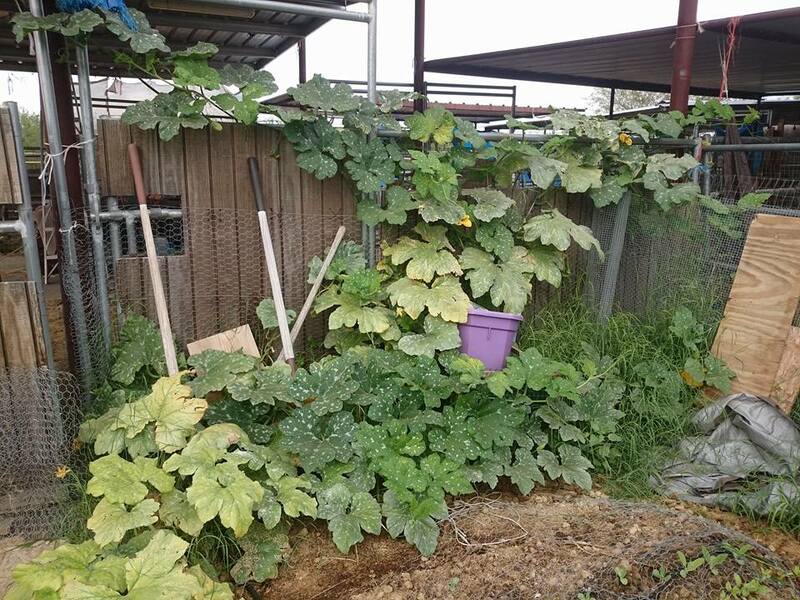 I had read that squash would deter weeds simply because the leaves are large and profuse. The weeds need sun too, supposedly, and the squash vines would completely shade the garden, preventing weed growth. Not so much, no. We pulled enough grass out of the garden in the first month, to feed all the ponies and goats for a week. As the vines grew and the garden became more and more inaccessible, did the shade deter that grass? Oh heck no. 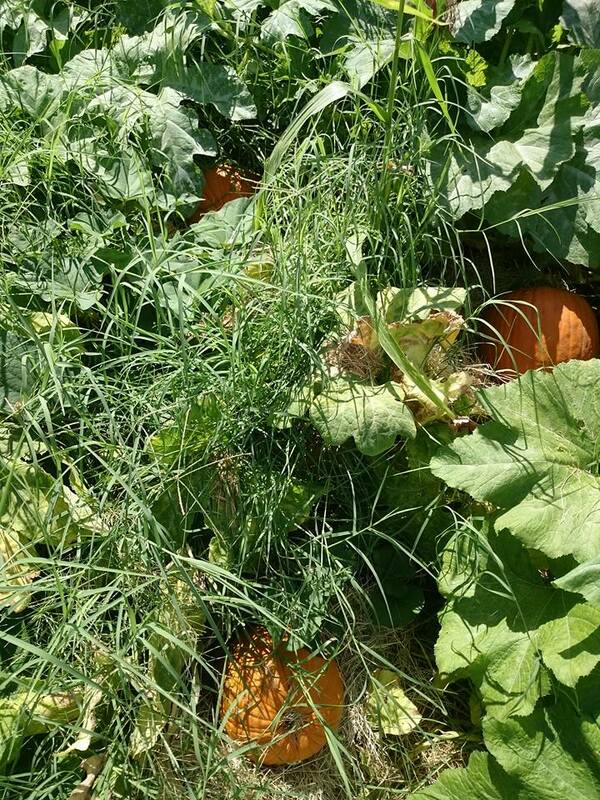 The grass was spreading as rapidly as the vines and actually grew taller than the squash leaves. 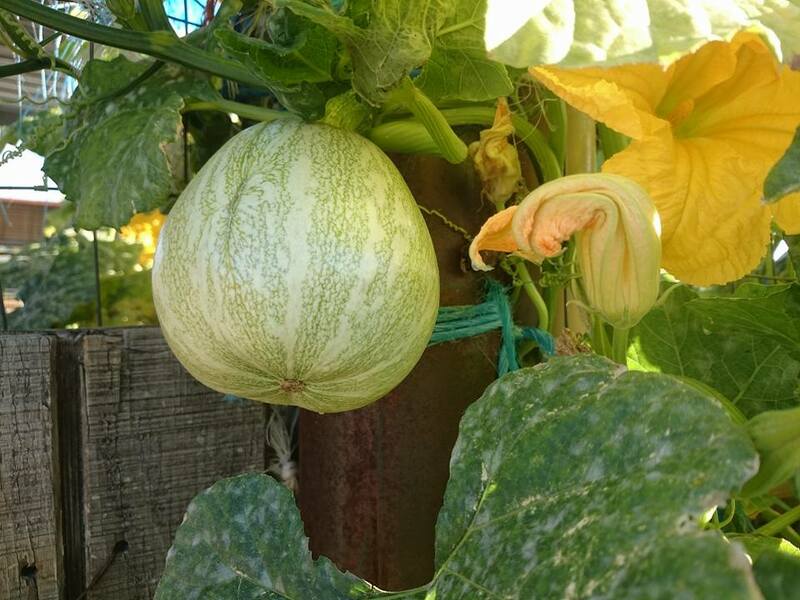 As pumpkins and squash began developing it was difficult to find them thanks to the proliferation of vines and grass. Many times we didn’t find them until the pumpkins turned orange. 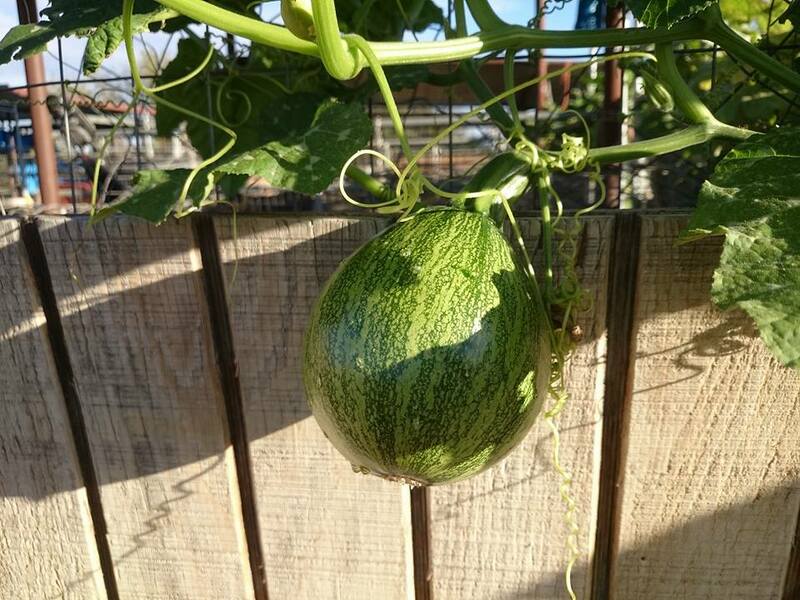 We’ve had quite a few surprise squash and pumpkins While the vines were small and the garden young, we did our best at weeding. After the vines took over, and the desert heat reached 115, we gave up. I do still grab great huge loads of bermuda to clear it away from any pumpkins I find, but that’s as far as it goes. The ponies love to get those grass handouts and I often come out of the garden with enough to feed one pony supper. The garden isn’t there to feed the horses. Thankfully, the local hay became less seedy when we began to fill the second half of the garden with the poo trifecta. We still have grass along the edges, but we keep it covered with tarps hoping it will die before it over grows my winter veggies. So far, no luck there. The fact that it is so determined to grow in my garden makes me wonder why professional hay growers here can’t manage a decent crop of bermuda. Perhaps they too should go around and collect the poop from all the people that pay top dollar for their crummy hay. If the copious amounts of bermuda have slowed the production of heirloom squash I haven’t noticed. I have gotten a great plenty of fruit on those vines. 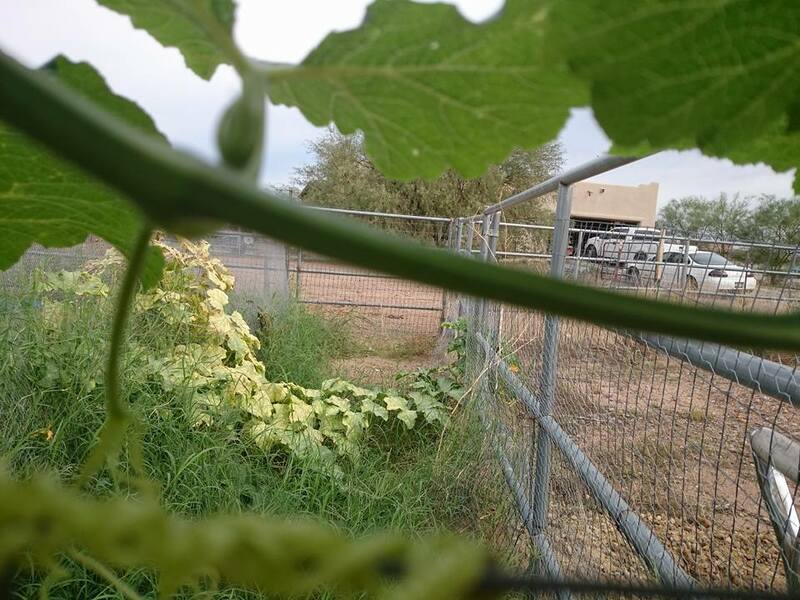 I would have expected more pumpkins with three plants sending out healthy vines so long that they’ve escaped all of our fencing and are currently aiming for a neighbor’s house 2 acres away. While the vines have not been affected noticeably by the bermuda, the sage, basil, multiplier onions, scalloped squash, zucchini, yellow squash and strawberries have been stunted at best. I had given up on my sweet potatoes at one point because the sprouts had been completely buried first by pumpkin vines, then by bermuda. 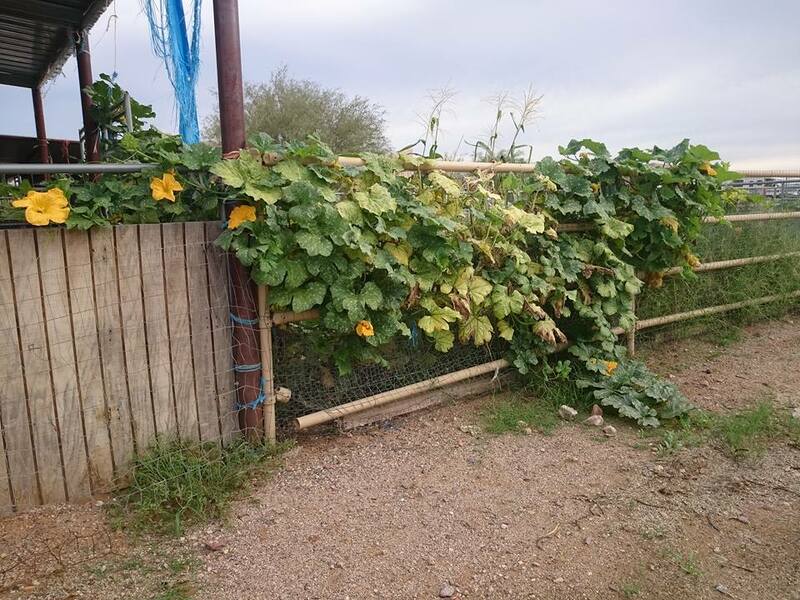 Amazingly the sweet potato vines worked their way upward to the tops of the pumpkin umbrellas and have now joined the other vines taking over the garden and making their way through the fencing and into the wider world. The basil actually managed to grow out from under the canopy. Right about the time the grasshoppers invaded. Grasshoppers don’t much like squash leaves and bermuda grass, more’s the pity. They’ll nibble at squash leaves, but then leave for tastier and more delicate fare. They have a great fondness for basil, mint (oh yes they do), sage, peppers and beans. I have made tea with some pretty ragged looking mint and spiced up a few recipes with holey basil, but they didn’t leave enough of the bean and pepper plants to allow those to produce anything edible at all. I probably wouldn’t have gotten any basil at all if the grasshoppers had been able to work down through the grass and the abundant vine to get to the entire plant. 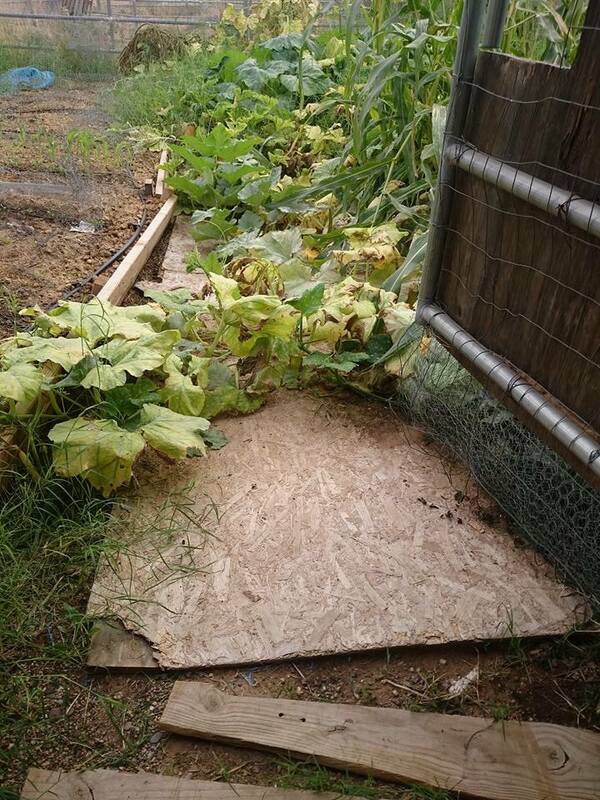 They could, however, reach the bush bean and the pepper and ate those plants to the ground. I’m glad I like squash. Neem oil seems to deter grasshoppers fairly well, but it often needs to be reapplied on a weekly basis. It can also harm bees so the best time to use it is in the evening once bees go home and try to avoid spraying flowers. I’ve also heard that a simple solution of a few drops of dish detergent mixed in a spray bottle of water will deter pests. I’m just not sure I want to douse my fresh herbs with much of anything. I don’t know if Neem oil alters flavor, but since I have a hard time getting the smell and taste of Dawn out of my pots and pans, I know I don’t want Dawn flavored basil. I have simply resigned myself to eating holey basil. Once chopped I can’t tell it’s grasshopper chewed and, as a friend says, “You can’t taste the holes”. 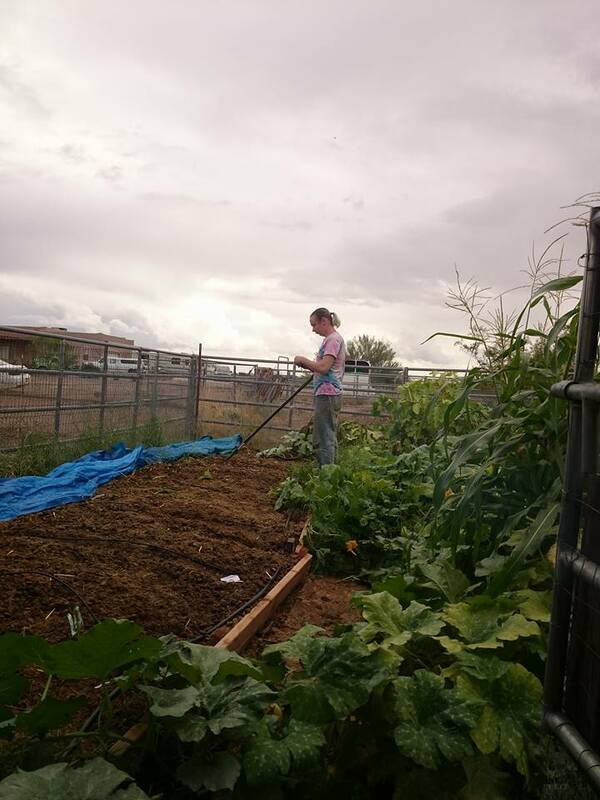 In spite of the desert heat, in spite of the monsoon winds that blew down my corn stalks, in spite of the grasshopper invasion, in spite of the abundant crop of bermuda and mostly in spite of my own inexperience, the garden has, for the most part, thrived. I have had fresh veggies every week since August. Granted, it’s mostly been squash, but I’ve also had mint for my tea, onion greens and a little basil to flavor my meals and I’ve managed to get a couple of ears of corn that the ants didn’t find first. As a matter of fact, the garden has thrived so well that I can’t get down that nice neat alleyway at all. There is just enough room in the garden to open the gate. Vines growing up the stall wall by the second half of the garden. This looks more like Hobbiton to me than Aridzona. I had to wrap the vine over the top of the gate as it was threatening to strangle anyone entering the garden. The vine escaping over the southern side of the fence and making it’s way out into a larger corral. 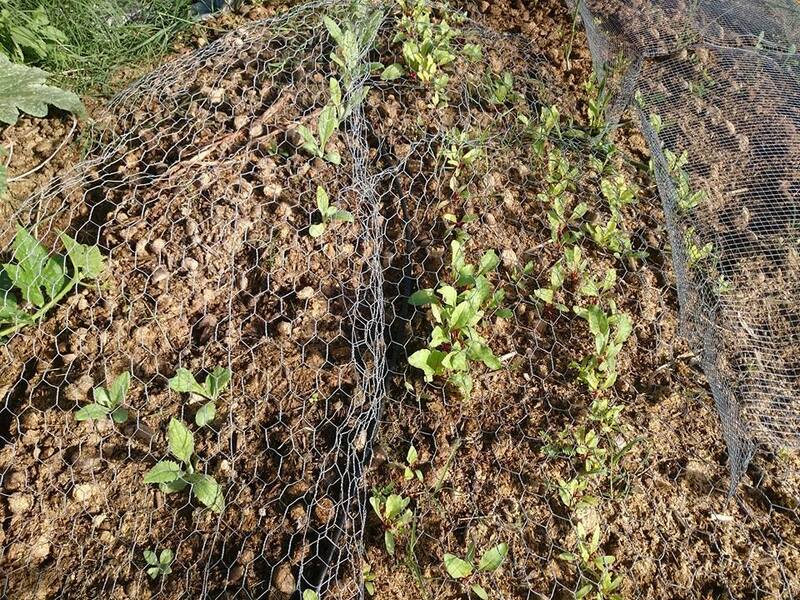 The vines escaping the short layer of chicken wire on the east end of the garden and climbing up the outer perimeter fence. It has now gone completely over the outer fence and is beginning to crawl toward the house across the street. I have made squash bread, sauteed squash, squash and basil soup (hey that was pretty good, Bev was right, I didn’t taste the holes in that basil at all), squash stuffed with italian sausage, bell peppers, onions and mozzarella, squash casserole, steamed squash, raw squash and pumpkin cookies. All in all, the experimental garden could be considered a success in that it has provided a lot of food and cut my grocery bill down to paper products, pet food, detergents and cheap meat. One variety of the heirloom squash will grow quite large. We’re talking soccer to basketball sized. 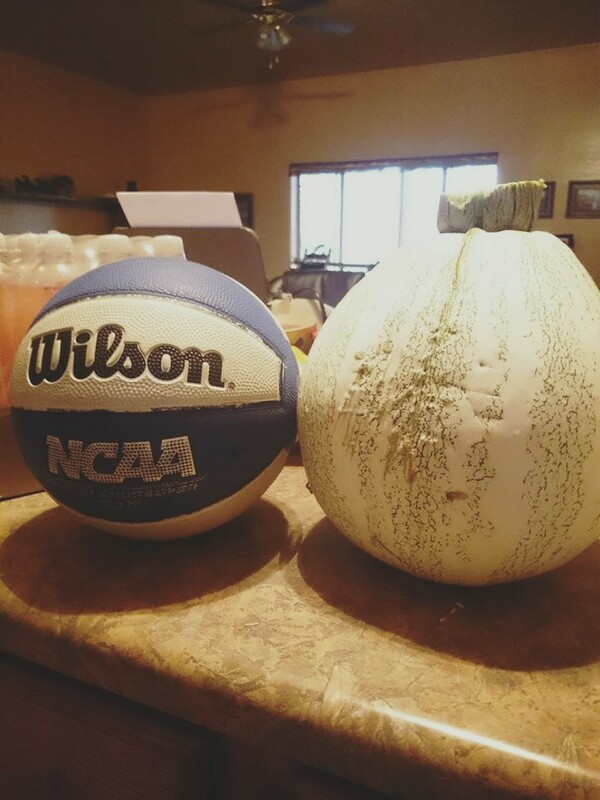 One such squash grew larger than a basketball and was dubbed Squashzilla. 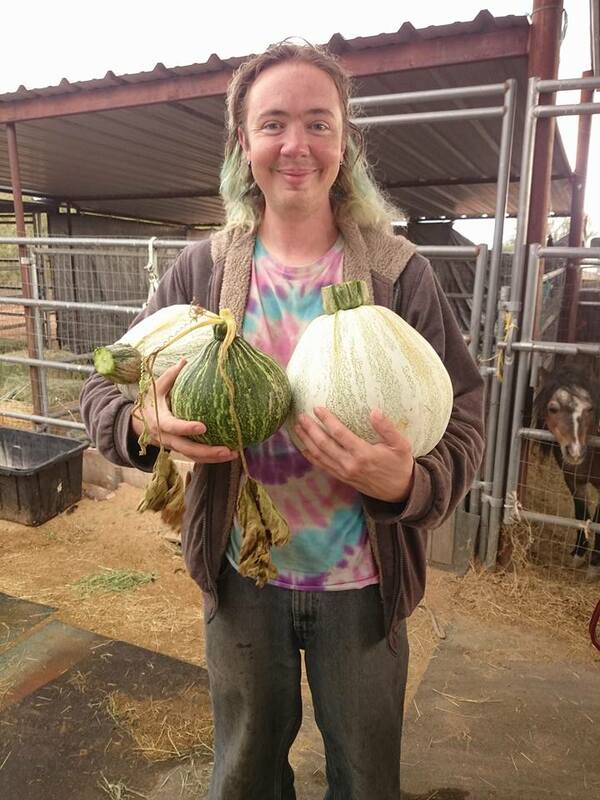 I took Squashzilla to the local swap meet just as a show and tell, hoping to get people interested in desert gardening, and ended up selling it to someone who was likely going to use it as a jack-o-lantern because they didn’t seem too interested in the many meals I told them they could get out of it. They were willing to pay 5.00 for one squash so I sent Squashzilla home with them, but not without a pang of regret. That squash would have fed me for two weeks. John holding about 18 lbs of squash, including Squashzilla, the day we harvested them. Braveheart is the photobomber in the background. The Great Gardening Experiment will be continued with the Winter Garden in the next day or so.